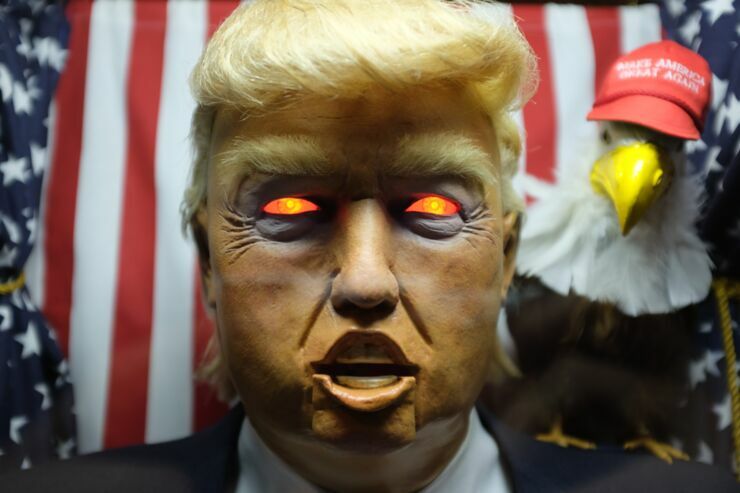 Donald Trump is not adverse to proclaiming doomsday-like rhetoric and so a group of artists from Brooklyn have taken his soothsaying to its logical conclusion. 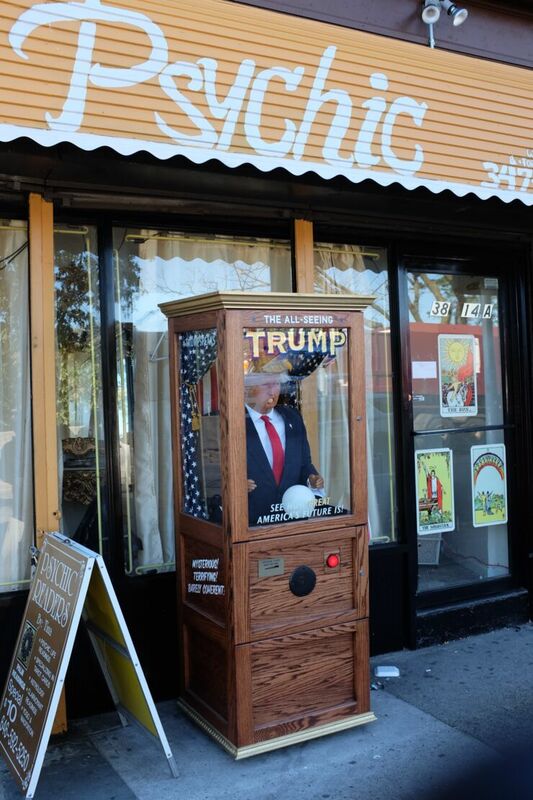 They've made a Zoltar-type (it was built by the same company) fortune telling machine The All-Seeing Trump featuring an animatronic Trump spilling forth gloomy predictions. "Basically the concept is that Trump foretells a very dark future where he has become president," the artists told Business Insider. "And of course he's very happy about it, but the rest of us... not so much." 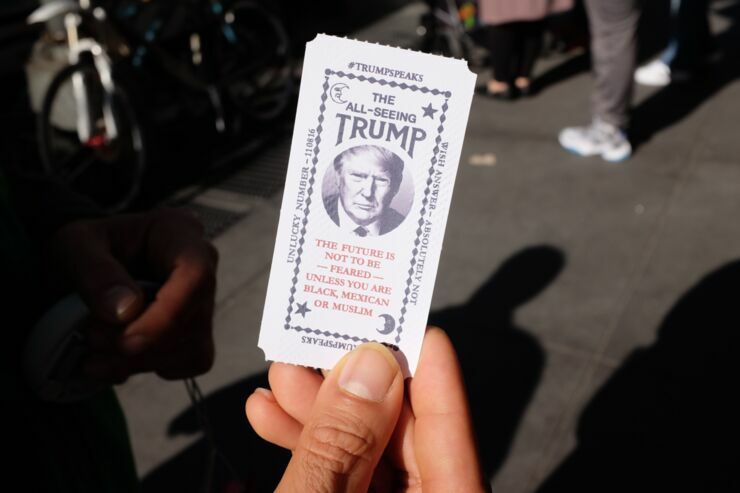 The group have been placing him at various sites around New York City—News Corp, Trump Tower, a mosque, a Mexican restaurant—and have programmed him to say 30 unique messages which tie in with where he's placed. You can also press the red button at the front and a "misfortune" ticket is given like "The future is not to be feared—unless you are black, Mexican, or muslim." 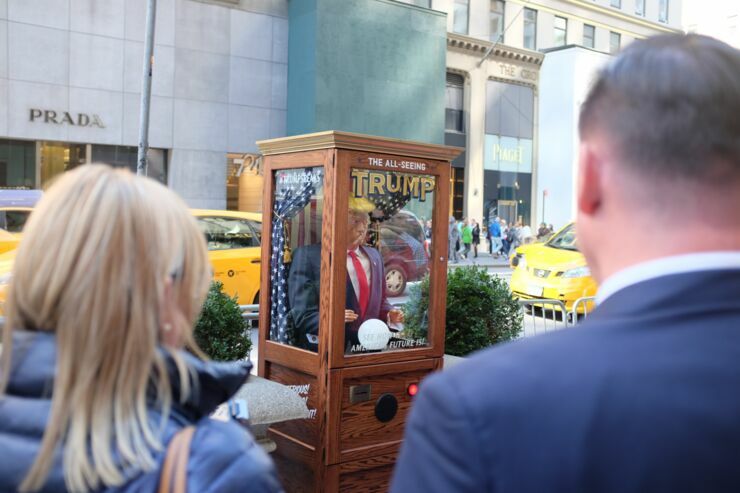 The group behind him say, "The 7-foot machine, which features an animatronic, speaking effigy of the portly billionaire, gives users a disturbing glimpse at the real-world ramifications of a Trump victory...If The All-Seeing Trump’s visions of the future seem far-fetched, remember, not long ago, so too did the very notion of a fowl-mouthed, narcissistic Reality TV star as a candidate for the highest office in America." 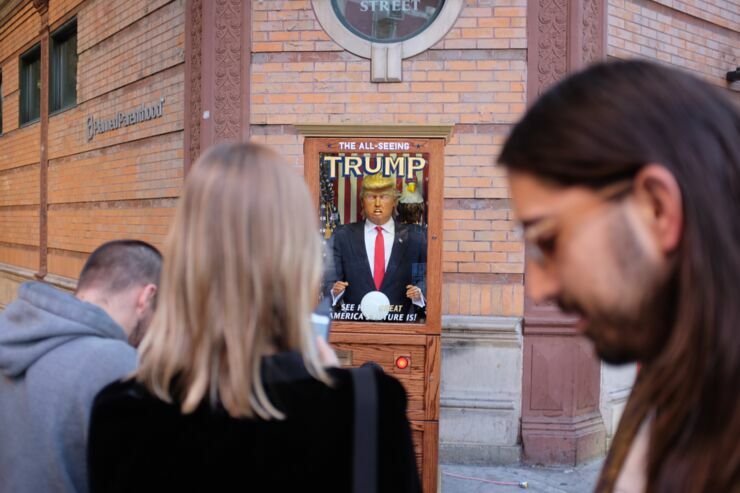 "The All Seeing Trump" has a Twitter account where it seems to be posting its location and the artists behind it say they'll keep moving it around the city. There's also a website where they're posting photos and locations too. Although he's spouting lines like "I'll have a nuclear war that'll make the Hiroshima incident look like campfire." they don't actually seem far off from what the actual Trump spews forth. It's hilarious and terrifying all at once. But not as terrifying as an actual Trump presidency, of course. What will happen when Trump gets to appoint a Supreme Court Justice? Will Scott Baio end up in charge of our constitutional wrongs and our rights? Will Trump invest tax dollars in a modern high-speed rail system with no seats, built specially to haul 11 million illegals back to Mexico like cattle? Will the U.S. carpet bomb the terrorists in Syria, and also take out their families for good measure? And what about jobs? Will we put the middle class back to work, cleaning up the piles of bodies left from the nuclear war Trump started because he couldn’t understand why we can’t use these nukes? The artists responsible for the interactive art piece hope to inspire a reaction that’s equal parts laughter and dread; that feeling one has when they’ve just awoken from a nightmare and haven’t quite realized it’s not reality. Yet.